In his 37-year legal career, Scruggs has served in several public sector positions, and led the human resources team at Office Depot, a Fortune 500 company. “My practice builds on a number of sources, including leading a state agency that touched the lives of every working Floridian and business, as well as deploying the human capital for an international company with more than 35,000 employees,” he says. Through the years, Scruggs has been widely recognized for his public service and community leadership, including chairing the Broward Workshop and serving on the Orange Bowl Committee since 1989. Last October, Scruggs received the “Heritage and Community Service” award from the Friends of the Broward County African-American Research Library and Cultural Center. In 2014, Scruggs served as chairman of The Florida Bar President’s Task Force to Study the Enhancement of Diversity on the Bench and the Judicial Nominating Commissions, and was honored by The Florida Bar with the President’s Award of Merit. Drawing on his wide range of experiences, Scruggs has built a dynamic practice that includes clients from throughout the U.S., Latin America and other parts of the world. From his office in downtown Fort Lauderdale, Scruggs advises companies and executives regarding employment law, negotiates employment and severance agreements and handles complex employment and commercial litigation. His work includes preparing executive agreements, negotiating terms of severance, and counseling companies on compliance with federal and state employment laws. He also defends CEOs and senior executives facing claims of individual liability arising from workforce compliance issues, including harassment and discrimination. For example, Scruggs is now advising a Latin American company about deploying its U.S. workforce in compliance with the employment laws in a number of states. He is also evaluating the restrictive covenants in a senior executive’s agreement and helping a retiring executive determine the best way to monetize his equity in the company. 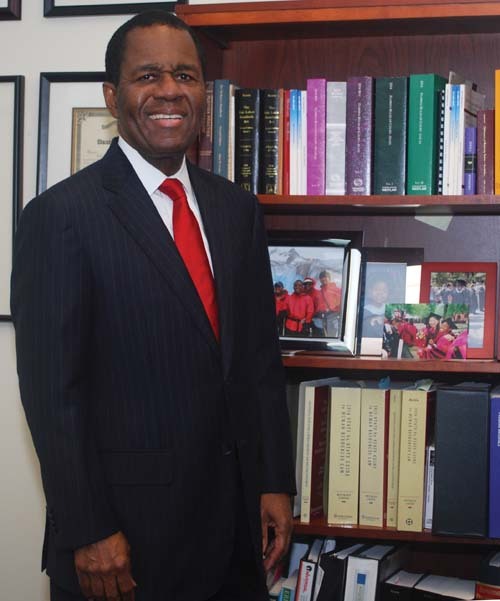 Scruggs majored in government at Cornell University, learning from professors like David Danelski, author of “Constitutional Law: Civil Liberties and Individual Rights.” After earning his bachelor’s degree, Scruggs went on to obtain a master’s in public affairs from Princeton University and a juris doctor from Harvard Law School. He retains strong ties to all three institutions, and serves on the visiting committee for Cornell’s College of Arts & Sciences. Scruggs’ daughter Dalila is a Cornell graduate, and his son Shea, a classical musician, is earning an MBA at Cornell. His daughter Lea, a former intern at CNN, is earning a master’s degree at Columbia University’s Graduate School of Journalism, and sons Jared and Christopher are earning graduate degrees at Florida State University and Georgia State University, respectively. Scruggs served as Secretary of Labor and Employment Security for the State of Florida in 1991-1992, and chaired the Florida Supreme Court Racial and Ethnic Bias Study Commission in the same time period. He was a member of the Florida Board of Regents from 1982 to 1987. In 1995, Scruggs joined Greenberg Traurig’s Fort Lauderdale office, and then worked as executive vice president with Office Depot in Delray Beach, before returning to private practice at Berger Singerman in 2007. “I am probably one of the few South Florida attorneys who has lived and worked as a professional in Miami-Dade, Broward, and Palm Beach Counties, and I retain strong ties in all three,” he says. Scruggs is also committed to being a good corporate steward, serving as a trustee emeritus of the University of Miami, and as a board member for SunTrust Banks, Inc., and Florida Blue.